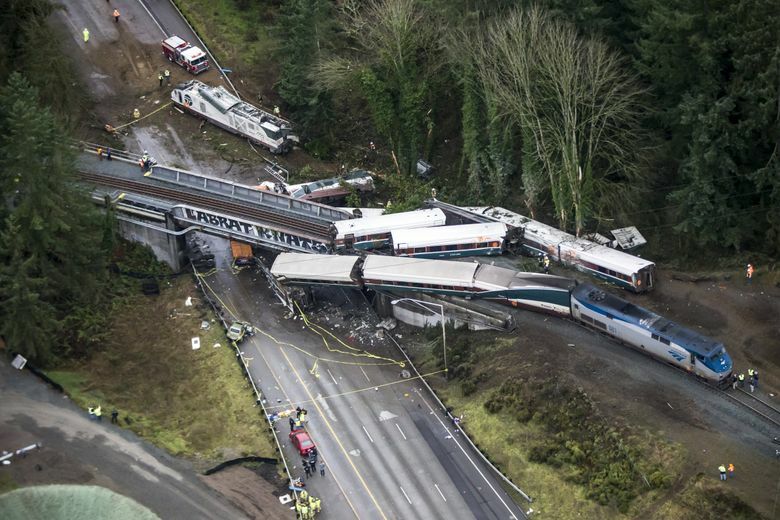 Monday’s Amtrak 501 derailment was horrific, especially for passengers and their families. 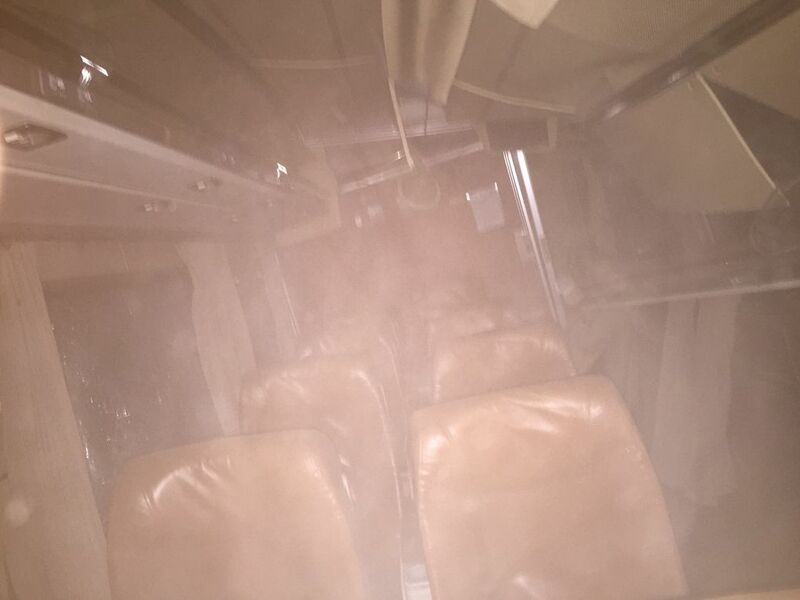 But it was also a story of courage by those passengers, along with witnesses and emergency responders. This is an inside view of what happened on Dec. 18. Rudi Wetzel was napping in his seat, his hat pulled over his eyes, when he awoke to what he thought was an explosion. 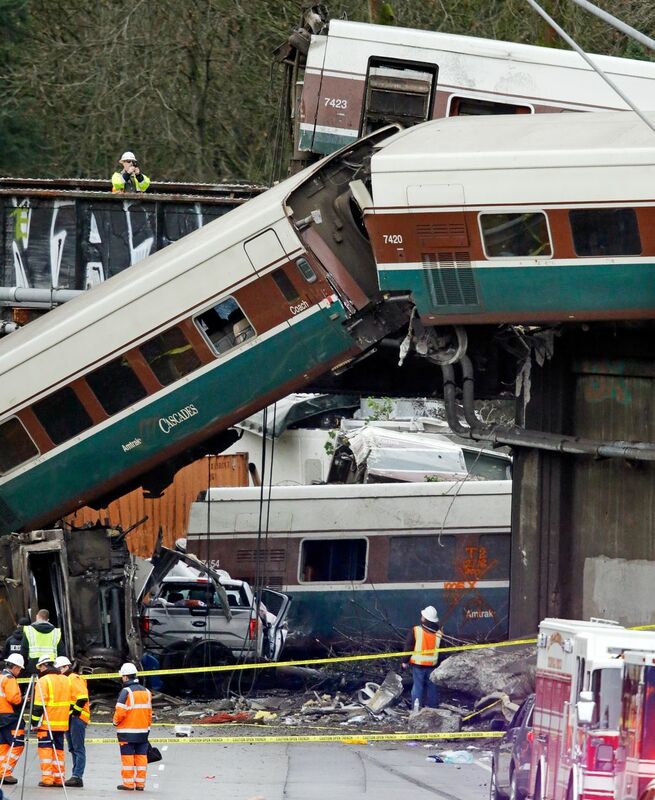 This story, an inside look at Amtrak 501’s derailment, is based on the accounts of survivors, their families and emergency workers and onlookers who rushed into action. It also draws from 911 dispatch recordings, a news conference recording and photos reviewed by Seattle Times staffers. A retired Los Angeles police officer, the 81-year-old had boarded Amtrak 501 in Seattle earlier that morning. He was on his way back to Centralia after visiting his girlfriend in Kirkland. Now he felt his body lift from the train seat, and then he was in the air, flying through darkness. Just before 6 a.m. Monday, Seattle’s King Street Station was dark except for the glow of TV monitors and Christmas lights. They must not have re-timed the lights for the new train, figured Jim Scott, a KING 5 television news photographer. For Scott, it was a relaxed morning shooting a “fluff piece” with reporter Alex Rozier. They would take the first ticketed ride on the new Point Defiance Bypass line, meant to provide more frequent, faster round trips between Seattle and Portland. But the train was already running a few minutes late by the time they boarded. At 7 a.m., Scott sent a live feed from inside the train as Rozier interviewed a carefree older gentleman named Rudi Wetzel. Wetzel told him how much he loved the train. A few minutes later, Scott and Rozier disembarked at Tacoma. Daniel Konzelman was southbound on Interstate 5 near DuPont, driving to work with his girlfriend, Alicia Hoverson, at about 7:30 a.m. when he saw an Amtrak train zip past his car on the adjacent tracks. He was going about 60 mph when it flew by. He drove that stretch every day and had never seen a train moving through there so fast. National Transportation Safety Board investigators would later determine the train was going 78 in a 30-mph zone when it jumped off the tracks. Inside the train, Chris Karnes, a software developer and transit advocate, heard a creaking sound and then felt the train rock slightly. Sitting next to him, his boyfriend, Christopher Scholl, looked up from reading on his phone. The car began to shake violently. To Karnes, it sounded like they were on the inside of an aluminum can being crushed. Oh my God, don’t derail, Scholl thought. Suddenly, Karnes felt his body launch into the seat in front of him. Scholl tried to brace himself, but went sailing, too. The train car’s lights cut out. Water poured from the ceiling. Dust flew up everywhere. The back half of the car was crushed. Somewhere, a woman began screaming. At the South Sound 911 center in Tacoma, the first call came in at 7:35 a.m.
“Hi, I’m reporting a train jackknife,” the woman caller said calmly. “A train?” the dispatcher asked. Other calls started flooding in. “The train is hanging off the overpass, it’s landed on vehicles and there’s people like, … there’s, there’s, there’s bodies laying everywhere,” another woman caller told a dispatcher excitedly. “How many patients are there do you think?” the dispatcher asked her. “Tons of people are hurt,” another woman, a passenger still inside the train, told a dispatcher. “Are you with anybody that’s hurt?” a dispatcher asked. “We’re all hurt,” she shrieked back. As cars lurched to a halt before him, Konzelman slammed on the brakes, and looked up to see a train — the same train that had passed him moments before — dangling from a bridge over the interstate. A puff of steam hung over the wreckage. He pulled over and parked on a highway ramp. From that vantage point, he and Hoverson could see train cars scattered everywhere. Konzelman, an Eagle Scout, looked at Hoverson, a former lifeguard. “Yeah, let’s do it,” Hoverson said. Konzelman rummaged through the back of his Eurovan and traded his dress shoes for some hiking boots. Hoverson grabbed a raincoat. They found a headlamp among the gear. Konzelman pocketed it. Then they tramped through a wooded embankment until they got to the track and ran toward the train. DuPont Mayor Mike Courts was driving to City Hall, which was closed Monday for a full day of incident-management training. At about 7:45 a.m., an unmarked police car blew past him with its lights and sirens on. So why was it rushing through his town? He pulled into City Hall and was greeted by City Administrator Ted Danek. “The train derailed,” Danek said. “Oh, is that the exercise?” Courts asked, thinking of the training. 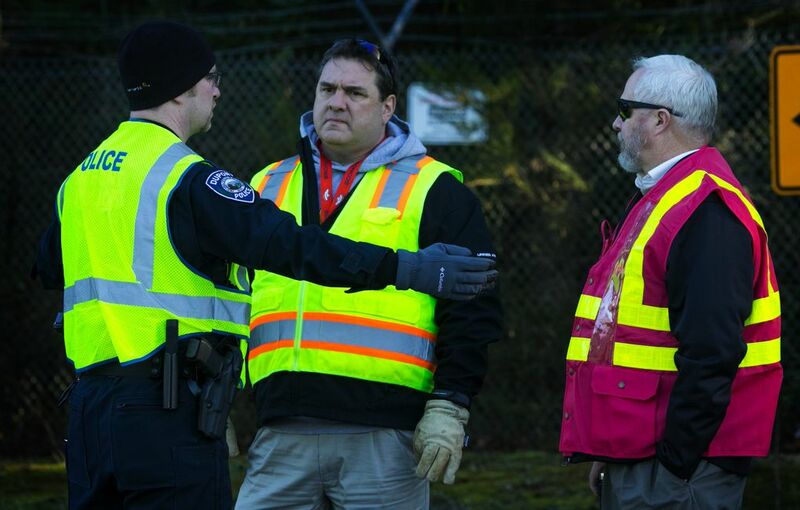 Ted Danek, center, the DuPont city administrator, and DuPont Mayor Mike Courts, right, speak to a police officer as a locomotive is removed from the wreckage. A KING 5 engineer picked up Rozier and Scott in Tacoma, and they headed toward the tangle of gnarled metal wreckage. When Rozier showed Scott a photo, it was as if a sledgehammer hit Scott’s stomach. When Rudi Wetzel’s senses returned, he heard people wailing for help. He was lying on a patch of gravel. A railcar wheel was suspended over his head. He pushed away the gravel and began to crawl up the embankment before grabbing onto the train to pull himself up. Pain shot through his back. He dropped back down to all fours. A woman came running toward him and draped his arm over her shoulder. He staggered at her side. His face was caked in blood. His hair, what little he has, was covered with dirt. Army 2nd Lt. Robert McCoy was on his way home for a quick shower after morning exercises at Joint Base Lewis-McChord when he saw train cars cascading onto Interstate 5. He slammed on the brakes of his Dodge truck and pulled off to the shoulder about 150 feet from the tangled wreckage. He grabbed a tourniquet and a first-aid mask from the truck and rushed toward a group of about 10 people who appeared to have been flung from the train onto the freeway. A train car hung over them. McCoy worried it would fall and crush them. He pulled a few of them to safety before other people arrived to help, and then he turned his attention to a car suspended from the trestle. He scrambled up the top of a semitruck crunched by a train car, using bars alongside the truck’s latches to climb. From there he was able to use an overturned railcar as a bridge to get to the dangling train car. Inside, McCoy found several people. He reached up, grabbed a woman and lowered her down to the “bridge” car, and then helped several more people down. Another Army officer, Lt. Col. Chris Sloan, arrived soon after, along with others. Inside the hanging railcar, a woman was wedged between a seat and the floor, with only her leg and hip visible. Her husband refused to leave her side. The military men lifted the seat up and pulled her out so she could sit up. “I’m going to be OK. I’m going to be OK,” she said. Konzelman, the Eagle Scout, donned his headlamp and worked his way through train cars on the freeway one at a time. Many of the people still inside the cars had broken ankles. Blood flowed from their heads. One man who appeared to be in shock was walking around covered in blood and without shoes. Konzelman and a law-enforcement officer punched through a window to get out of one train car and into another, which had flipped upside down. He found several people pinned in the wreckage. One man was trapped from the waist down between the train’s roof panel and some aluminum pieces of the interior. Konzelman rubbed the man’s back and held his hand. He asked him what his kids’ names were. “You’re doing great. Just relax. You might be here for a little while. Make yourself comfortable,” he told the man before firefighters could free him. As her boyfriend made his way through the cars, Hoverson checked on a group of survivors who had walked out of the crash. Two children — a girl Hoverson thought was about 13, and a boy of about 11 — were looking for their father. Hoverson put one hand on the girl’s shoulder and another on the boy’s back. Wendy Simmons, who had stopped her car to help, found herself standing over a man who had been flung from the train with such force he came out of his shoes. He was lying on the asphalt, some distance from where the train car dangled over the freeway. She grabbed two blankets, placing one under his head and covering him with the other. His name was Drew, she learned. He was concerned about someone else on the train. Emergency-care managers Pam Montague and Jackie Brown were just leaving their office at Providence St. Peter Hospital in Olympia to get coffee when the charge nurse grabbed them. “We have a mass-casualty incident and we need to open the DMCC,” he said, referring to the region’s Disaster Medical Control Center. They canceled all elective surgeries, began communicating with other hospitals and had extra stretchers and wheelchairs brought in. Surgeons, anesthesiologists, X-ray staff and respiratory staff gathered in wait. Doug Mitchem was at his home in Centralia when he flipped on CNN just before 8 a.m., as he did most mornings. 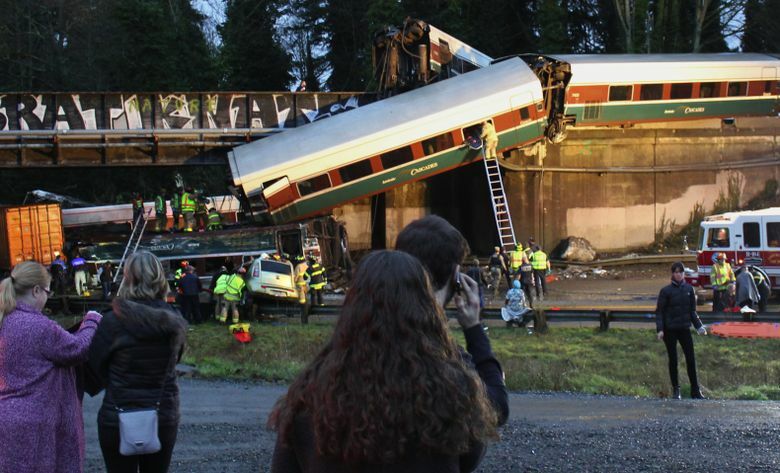 The derailment of Amtrak 501 was leading the news. He wondered if his son, Drew Mitchem, had been aboard. Doug knew his son had planned to ride a new Amtrak line with his friend Dale Skyllingstad, but wasn’t sure if this was the same train. Drew worked for a rail company and loved to ride and photograph trains. He’d probably been on every Amtrak line in the country, Doug figured. Doug’s wife, Connie Mitchem, was leaving the house to go swimming. Doug didn’t tell her about the derailment, hoping to spare her the worry. Dr. Nathan Selden, on his way from Portland to Seattle on Christmas errands, pulled his car over at about 8 a.m. and worked his way to the median, where emergency responders had set out red, yellow and green tarps for triage. He began cycling through patients. At one point, someone brought him a baby whose parents had barely managed to hang on to during the wreck. In Selden’s care, the baby was ticklish and giggling and smiling, apparently plucked from the wreckage unharmed. Sometime after 8, Doug Mitchem’s phone rang. The caller told him that her name was Wendy. She wanted him to know his son was headed to Allenmore Hospital in Tacoma. Drew was conscious, and he knew his own name and his parents’ phone number, she told Doug. In fact, minutes before, Drew had actually provoked a chuckle from his rescuers. As Wendy and five others prepared to lift him on a backboard, an emergency responder patted his underside to check that the straps were secure. It took about an hour for Scott, the TV photographer, to arrive at the scene. Now he stood on the overpass, surrounded by news reporters and photographers. For the next four hours he would be pinging live images of the train crash back to the station in Seattle. He couldn’t stop zooming in on train car 3, wondering about Rudi. 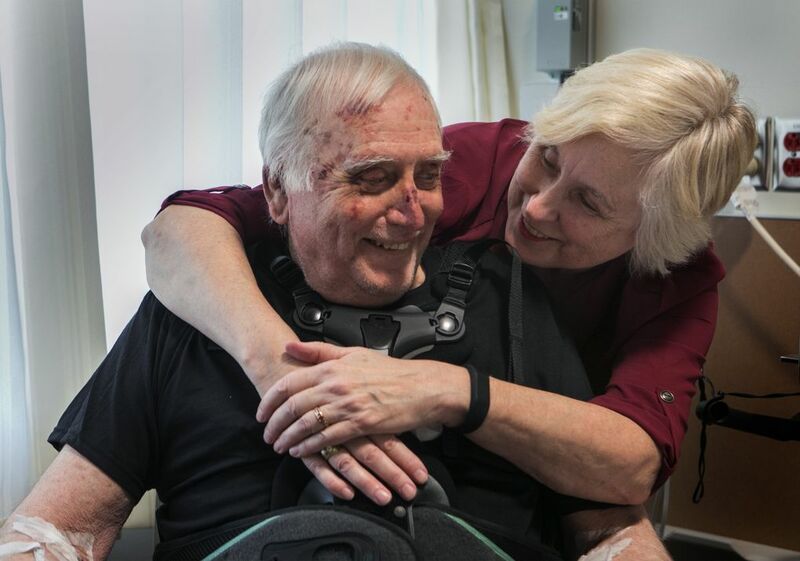 Rudi Wetzel was one of 11 patients whisked into emergency rooms at Providence St. Peter. Three people went directly into operating rooms. Some had broken limbs. There were scalp injuries. A few had deep gashes. Two of Rudi’s vertebrae had received compression fractures. He was bruised. The next morning, he greeted KING’s Rozier and Scott warmly as they visited him at his hospital bed. Somehow it all fits in the trunk of Bob Ihler’s Toyota Camry — the brochures, the first-aid equipment, the stuffed animals, extra blankets, coats and the biohazard equipment. When you’re a chaplain, you never know what you’ll need. At about 9:45 a.m., passengers who were not seriously injured began arriving at DuPont City Hall. Many were ashen-faced with eyes glazed over. Some wanted to talk, but didn’t know what to say. Tears welled when they started to share. Investigators pulled each of them into the corners of the room for interviews. Ihler walked around the room, offering a listening ear. Trauma is not only physical, of course. Monday was the worst day of Liz Skyllingstad’s life. For hours she had been calling around, trying to find out anything about her 29-year-old son, Dale Skyllingstad. She knew he was on the train; he’d been planning the trip for about a month with Drew Mitchem. She called hotlines for victims’ families. She called Doug Mitchem. He’d heard from Drew, but nothing about Dale. A friend of a friend at Madigan Army Medical Center told her they’d received some John Does. Her worry grew as she followed the news on Facebook. The Associated Press was reporting that six people were dead, citing a federal source. The death toll later would be confirmed as three, with more than 80 injured. Dale, a sound engineer at Seattle Center, had loved trains since he was a toddler. He’d grown up on Salmon Beach in Tacoma and loved to watch the trains go through a nearby tunnel. He had traveled all across the U.S. on trains, taking trips with friends and family. Trains magazine had published his photography. He prepared the audiovisual presentation at the Autumn Leaf Railroad Slide Show each year in Centralia. Finally, that afternoon, the hospital called. Dale, Liz’s computer-whiz son, could hardly manage words, but somehow communicated a phone number with a hospital staffer. He was in the intensive-care unit at Tacoma General Hospital with a broken pelvis, a spinal fracture, a cranial fracture and lacerations on his liver and kidney, among other injuries. Like his friend Drew Mitchem, he had been thrown from the train. Liz’s son was alive, but she learned that two of his acquaintances had been killed — she wasn’t sure of their names. The three people killed had all been train enthusiasts: James Hamre, 61, Zack Willhoite, 35, and Benjamin Gran, 40. Dale’s family visited him on Monday, but hospital staff told them to avoid waking him up. On Tuesday, they finally got to talk. Heavily sedated, he could manage only a few words. “I love you, buddy,” she told him. Dale replied as he always did. It was something of a family joke. Seattle Times staff reporters Hal Bernton, Lewis Kamb, Sandi Doughton and Jessica Lee, photographer Ellen Banner and news researcher Miyoko Wolf contributed to this report.